Discover how we helped Enfo create awareness for their new service and increase ROI. Why did we choose an integrated approach? Integrated marketing campaigns strengthens your brand and guides prospects and existing customers further down the funnel. Discover how we implemented an integrated campaign for Enfo that increased their ROI. 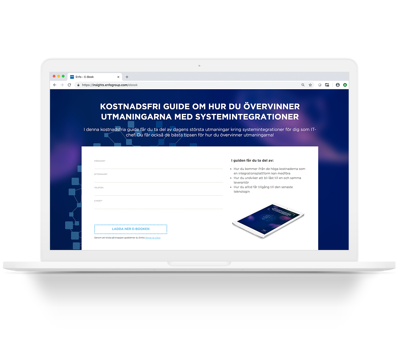 Enfo is a Nordic IT service company that enables customers’ data-driven business transformation. When Enfo launched their new integration-as-a-service offer, Brightvision was tasked with producing an integrated marketing campaign. The new service meant that customers could let Enfo take care of all their integration needs in the cloud. Our challenge was to introduce the new service as better than existing solutions on the market. The purpose of the campaign was to build awareness around the new solution and increase ROI by attracting new leads. To do so, we built a campaign around the launch of the new service featuring content for every step of the buyer journey. All content was hosted on a microsite that would eventually serve as a product page in the long term with the purpose of positioning the service. Brightvision planned and executed a lead generation campaign centered around a microsite packed with content. The content featured on the campaign site covered every step of the buyer journey. It also included a contact form for those prospects that were ready to speak to an integration expert. The campaign also included an email nurturing flow using relevant content and prompts to drive prospects further down the funnel. Three video blogs where we tackled a different stage in the buyer journey. The goal of the campaign was to create awareness for the new service and generate ROI by generating new leads. To succeed, we needed to create an inbound marketing strategy focused on producing relevant and engaging content. A successful campaign strategy requires research. We began the process with interviewing Enfo employees to get a more in-depth understanding of the market and the product. Together with Enfo we developed two user personas that were the primary target audience throughout the campaign. The campaign strategy was specifically developed to tackle the challenges Enfo faced when launching a new solution. We also included a buyer journey timeline in order to know exactly when different types of content should we produced and launched. Armed with a completed campaign plan, it was time to get started with content production. First, we designed and developed the microsite – the core of the campaign. These were created in Enfo’s marketing automation system, HubSpot. The copy was produced specifically to resonate with the user personas we had identified during the planning phase. We also used HubSpot to create the forms on the microsite which then prompted the email nurturing flows. These nurturing emails were meant to drive the potential buyer further down the funnel. These emails were also essential in the mission to create awareness about the new service, since they gave us the opportunity to deliver relevant content at the right time. To further guide prospects closer to a purchase we created three video blogs, one for each stage of the buyer journey. The whitepaper we had previously created served as the foundation for these at we broke the content down into three main themes. The final piece of content was an animated product video explaining the benefits of the new integration-as-a-service offer. This was the main product specific piece of content meant to be consumed at the final stage of the buyer journey. See the video here. When the microsite was ready it was time to populate it with content. 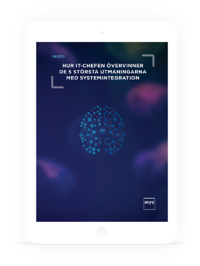 Together with Enfo we produced an informative whitepaper geared toward our target audience and their pain points. We also wrote an article for the purpose of native advertising. Native advertising is a form of paid media where the content promoted doesn’t look like ads, but is simply a part of the environment where it published, such as an online magazine or other forms of online publications. We utilized direct marketing by sending physical mail to 50 warm leads. The branded package contained a smart light bulb along with product information and an introductory offer stating that “Your first integration is on us.” This was meant to evoke the recipient's curiosity. We also prompted them to visit the campaign microsite to learn more about the new service. The purpose of the teleprospecting campaign was to create interest in the new solution, qualify leads and book meetings with relevant companies. Our teleprospecting campaign focused on the first to stages of the buyer journey, awareness and consideration. We created a list based on existing customers that we identified as “awareness” stage. Next, we called them and qualified them for either a direct mail, a meeting or invited them to visit the campaign site. During the second phase of the teleprospecting campaign we called leads that had converted on any of the campaign landing pages ny downloading content. When we called leads that were identified as “consideration stage” the only purpose was to book an appointment with a integration expert at Enfo. Our teleprospecting efforts generated 22 booked meetings with a conversion rate of 33.8 percent. When the campaign period ended we looked at both qualitative and quantitative results. These offered invaluable insight to the performance of the campaign, target audience and content. Did we reach the campaign goal? Is the client happy with the results? In this campaign, at the back of a successful launch of their new integration-as-a-service offer, Enfo were happy with both of the above.